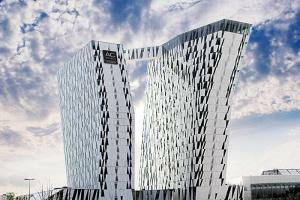 With unique architecture and boutique accommodations, AC Hotel Bella Sky Copenhagen is a stylish destination for leisure travel. Relax in spacious rooms featuring floor-to-ceiling windows, authentic Danish accents and free Wi-Fi. Start your morning with a hot breakfast buffet at BM Restaurant and bring your eventful day to a close with delicious, locally-sourced fare at Basalt. With a spa, fitness center, and pool, this hotel offers an exceptional experience.